POSTED SATURDAY, AUG 25TH: THIS RUN HAS BEEN CANCELLED IN ORIGINAL FORMAT. THE SOLDIERS OF REDEMPTION HAVE DISBANDED AND ARE NOT SPONSORING THE BIKE RUN. HOWEVER, EASY STREET HORSE RESCUE WILL BE AT THEIR CLUBHOUSE (WE HEAR IT IS CLOSED UP) FROM NOON-1:00PM FOR A MODIFIED RUN FOR ANY RIDERS WHOM MAY SHOW UP AND SUPPORT THE HORSES. THE RESCUE WAS COUNTING ON THIS FUNDRAISER TO HELP PAY OFF OUR $3000 VET BILL FROM THE MARCH 22, 2012 RESCUE OF 15 HORSES. 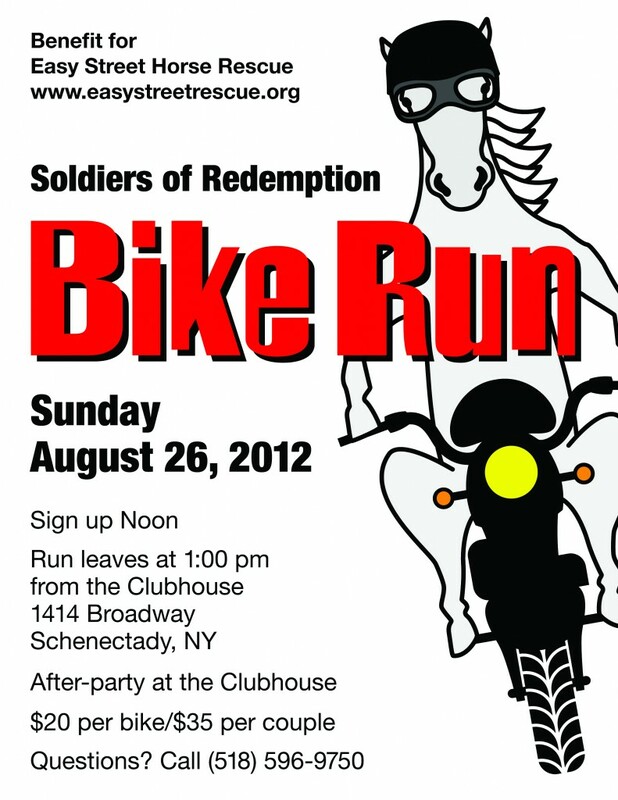 THE MODIFIED RIDE IS $10 PER BIKE, WILL WIND THRU SOME BEAUTIFUL COUNTRYSIDE AND END AT EASY STREET RESCUE, WHERE YOU CAN MEET THE HORSES YOU ARE HELPING. DONATIONS APPRECIATED. QUESTIONS? CALL NINA AT 518-212-2033 UNTIL 9PM OR CELL PHONE AT 518-421-0125.